I have always had two or three monitors on my desktop, all connected to my main computer. In addition, I have a large wall-mounted LCD TV, also connected to the main computer, on which I display presentations and use Windows Media Center (or occasionally an HTML5/Flash/Silverlight player, if I have no other option) to view films and other video. When I watch films at night, I turn off the desktop monitors, because I want it to be dark in the room. This has always worked well, until recently when I upgraded the main desktop monitor. Now there is a problem: when I turn on the monitor again, all windows on that desktop are moved to a different monitor (even the minimized ones, which are the most numerous). Hence, I have to move manually all these windows back to the main monitor each time I turn it on again. Naturally, this is highly annoying, and, unfortunately, there seems to be no good solution or workaround offered by Windows. For instance, although it is easy programmatically to make all monitors go to sleep (by sending a WM_SYSCOMMAND message with a wParam value of SC_MONITORPOWER and a lParam value of 2), this has the unfortunate effect of also turning off the wall-mounted LCD TV, which has a clearly detrimental effect on the film-watching experience. 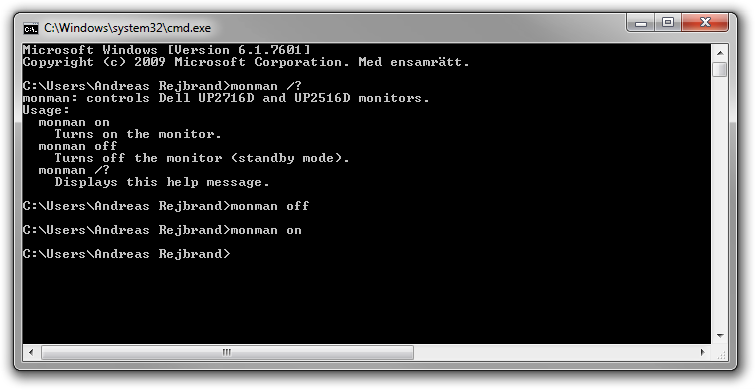 The new monitor happens to come with a very easy-to-use SDK (basically a DLL and some documentation). I happen to be a Win32 programmer.